Bar bending schedule (BBS) of an concrete footing provides the reinforcement details and the total steel quantity required for the footing construction. 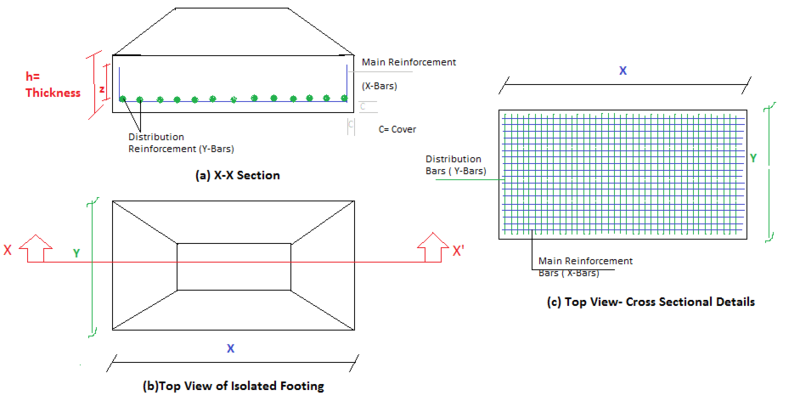 The BBS and quantity of steel reinforcement required for a simply isolated footing are calculated and explained by means of a workout example. The figure-1 below shows the cross-sectional plan and section of an isolated footing. The details of reinforcement used in the footing are calculated from the detailed drawing of the structure prepared by the designer. The structural drawing provides the reinforcement location and their specifications. Given below is an example of an isolated footing with specifications and dimensions. The number of reinforcement bars, their length and the quantity of steel for the given Isolated footing is estimated and consolidated in a tabulated form ( Table-1).